You want waterproof smartphone? Cherry Mobile Defender is the latest phone from the company that has this kind of feature you are looking for. The specs are impressive, aside from water resistant and dust proof it also runs on an octa-core processor Helio P1 from Mediatek clocked at 2.0 GHz. When it comes to multi-tasking, you can also rely on its 3GB RAM and 32GB internal, expandable via microSD card for your big files. The camera of Cherry Mobile Defender also is another plus, it has 18 megapixels on the rear side and 8-megapixels selfie camera at the front. You can also experience the best of an Android Marshmallow operating system that offers smooth and clean UI. There’s more on this tough and powerful smartphone, the 4.7-inch screen is coated with scratch resistant Corning Gorilla Glass 3 with rubber and metallic frame protection on its side. Defender is also rated IP68 just like Samsung Galaxy S7, it’s protected from immersion in water with up to 1-meter depth for 30-minutes. 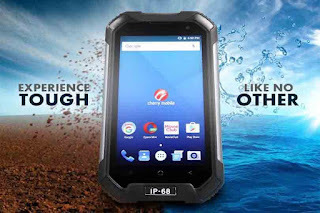 This phone fits to those who have super active and adventurous your lifestyle, for only 9,999 pesos you can experience tough like no other.